Ian was born in Malawi in 1965 and grew up in the countryside of Zimbabwe. Throughout his schooling years he was deeply committed to any wildlife pursuits that came his way and was actively involved with the Natural History societies at both schools. After completing his schooling he then moved to England to further his education. This was the start to his professional career with wildlife. He worked at a number of wildlife centres but primarily at Whipsnade Wild Animal Park where he worked as a zoo keeper for five years. He completed, with distinction and the highest marks in the country, a City and Guilds diploma in Zoo Animal Management. Having obtained his diploma he returned to Africa and started working at Thornybush Private Game Lodge in the then, Eastern Transvaal. He stayed there for eight years improving on his knowledge of wildlife and also how to deal with people and other aspects of the lodge industry. He has an enthusiastic interest in wildlife photography, an aspect he places with high importance to his wildlife interest. 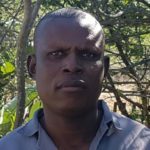 He qualified as an Advanced Trails Guide with FGASA, has passed the theory aspect of the SKS Birding exam and is currently busy with the slide and sound assessment for the Savanna and Core bird exam. During his time at Thornybush he facilitated over 200 companies on team building programmes and feels well qualified to help students understand the principles of teamwork and working in close-knit communities. He also served as Chairman of the FGASA Lowveld North region for several years. 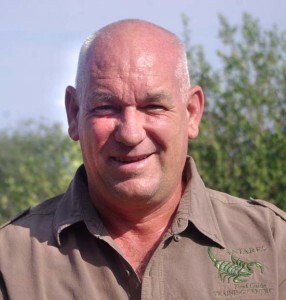 He has also served on the Grietjie Nature Reserve committee for over 11 years, including as chairman from 2004-2008. From 2016 until 2018 he was employed as the Guide Training Project Manager for BirdLife South Africa. He has been a member of BirdLife South Africa and the local Phalaborwa bird club since he moved to the area in 2000. He has been involved in surveys over the past eight years looking for the rare and elusive Pel’s Fishing Owl along the banks of the Olifants river, and has been lucky enough to have had several sightings of these beautiful birds. He is deeply committed to providing a professional service to any client or guest. When it comes to training new guides he is determined to ensure that successful students will complete the course with the same set of values and carry these through to wherever they end up working as guides. Mel is also involved with the training programmes from time to time. She has a degree in Environmental Biology, spent three years working as a zoo keeper and two years as a teacher at a children’s environmental education centre in the UK as well as having completed her FGASA level 2. 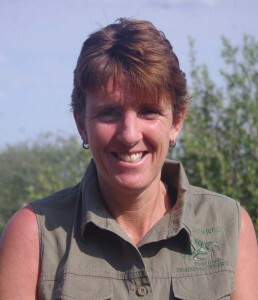 She worked at Kingfisher Private School as a teacher’s assistant for over three years and she headed up the wildlife club, and eco-schools programme for them as well as the Health and Safety portfolio. She then home-schooled their children for three years before they moved to Southern Cross School in Hoedspruit. Ian met Mel on the reserve soon after Antares started and they were married in March 2003. Between them, they try to ensure the smooth running of the centre and lodge. While Ian is devoted to the actual teaching aspect of the training course, Mel performs a great deal of hard work behind the scenes, regularly upgrading the course content amongst other things and serving as back-up guide when required. They have two children; a son Cary who was born in 2004 and a daughter Savanna born in 2008, both of whom are keen naturalists and will always be keen to exhibit their knowledge to the new students when they arrive. Both their children are junior members of FGASA and have already made leaps and bounds with their Pangolin qualifications. Cary is currently busy with the Wild Dog levels and both have completed various specialist subjects such as birds and reptiles. Linky has worked at Antares for several years now ensuring that the facilities are always kept neat and clean, doing all the washing and related laundry. She always has a smile on her face and is an extremely loyal employee.